Our sweet Carly is 6 weeks old and now weighs a whopping 4 lbs. 1 oz. She's starting to really chub up and is looking so good. She needs to weigh at least 5.5 lbs before they will do the surgery to re-connect her intestines, so we are just patiently waiting for her to grow and gain weight so they can get that scheduled. She's had quite a few apnea and bradycardia episodes (periods where she has stopped breathing), which have been kind of scary. They were pretty consistent for about a week, but she isn't having them as much any more and seems to be doing much better. She has been sucking really well on a Binky and loves it when the nurses put chap stick on her lips. So for Christmas we plan to get her some yummy flavored chap stick so she has some fun flavors to enjoy. Her heart murmur has all but disappeared, so that is good news. They also do regular tests on her eyes because the oxygen can cause eye damage and vision loss. So far her eyes are looking really good and don't seem to have suffered any damage yet. 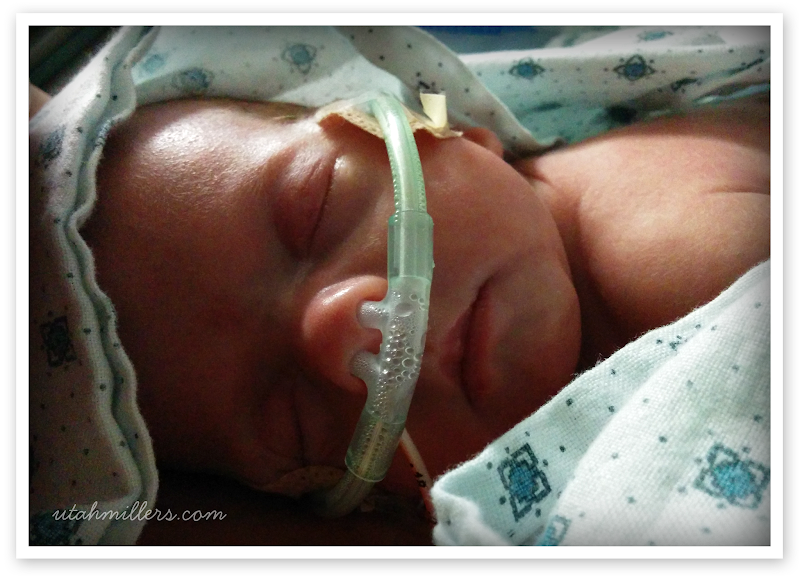 The picture above shows her on a smaller nasal cannula, which is what she is currently sporting. Her feedings are going really well and she is absorbing about half of the breast milk they are putting in her through the feeding tube (the tube you see going into her nose). 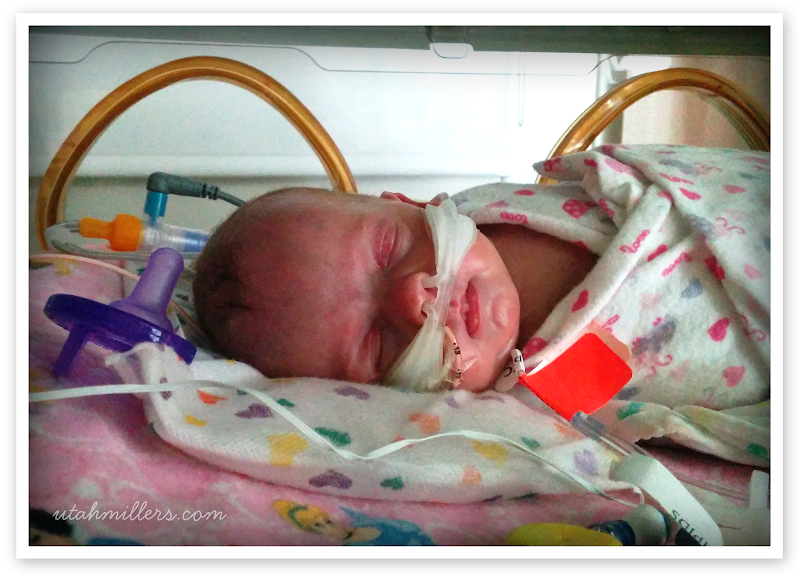 They are gradually increasing the volume of her breast milk feedings and as they do that, they are gradually decreasing the TPN. 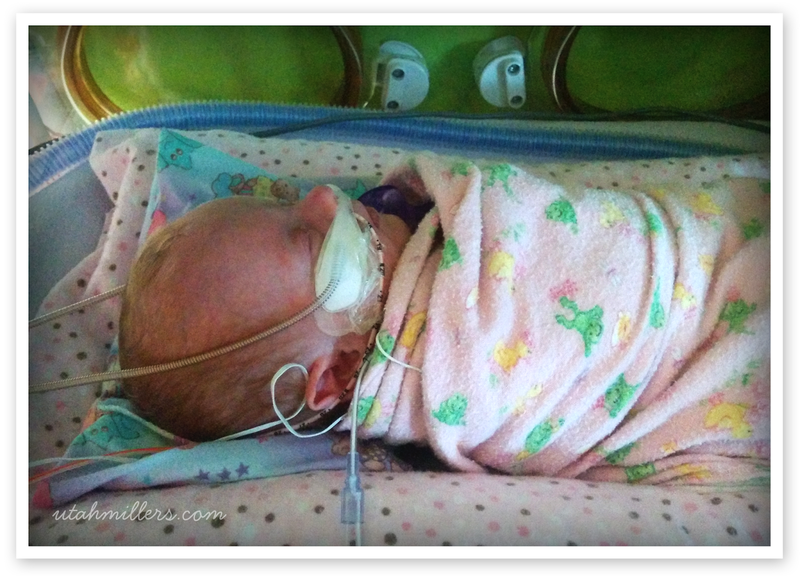 The goal is for her to be completely weaned off TPN by the time she goes home from the hospital. She still has the little stoma bag that her stool is going into and that will be removed once she has the surgery to sew her intestines back together. The doctors haven't given us a time frame of when she'll be able to come home yet, but we're guessing she probably has a good two months or so before that will start becoming a possibility. She still has quite a ways to go, but she really is progressing so incredibly well and our prayers are being answered. Here's a little video of Mike Skyping with his mom, who is serving a mission with Mike's dad half way around the world in Budapest, Hungary. It is totally killing them to be so far away right now but we truly feel that their service and sacrifice is blessing little Carly in amazing ways and helping her to heal. 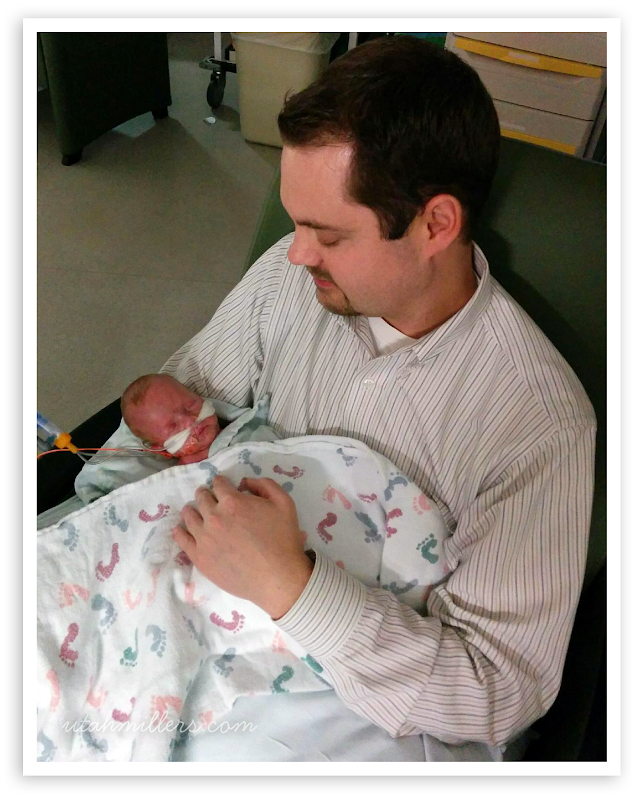 Mike still visits her most days after work and I go every morning and hold her skin-to-skin for about an hour. I love that time with her and I can tell she really looks forward to it too. I have a little routine that I do when I hold her. 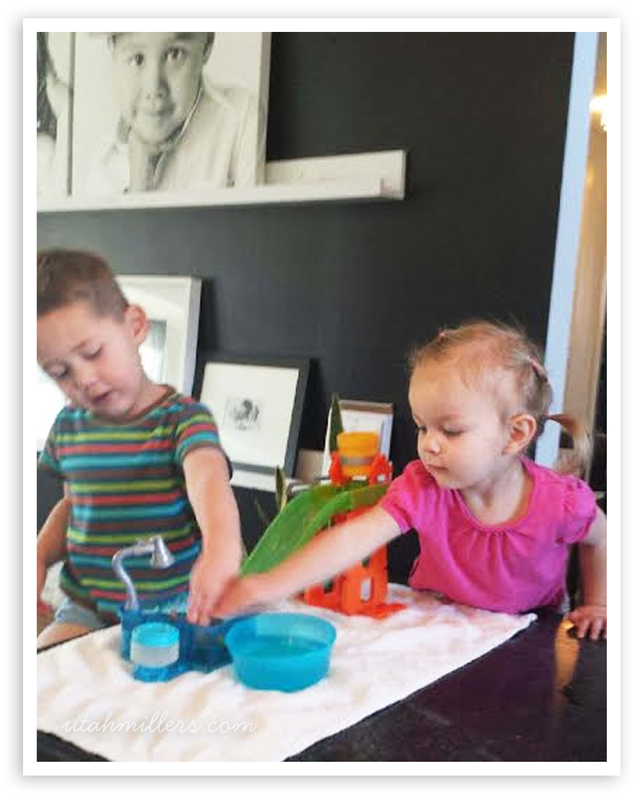 First I tell her about what we've been up to back home and about all the fun/silly things Bryson and Lilly are doing. Then I play her some music on my phone, which she just loves. While I talk to her and play her music, she just looks up at me and all around the room with her big dark eyes and I can tell she really enjoys it. Then she falls asleep for the rest of the time and I relax, read the news, read scriptures, answer emails, Facebook, etc. While I spend that time with Carly every day, Lilly gets to spend time with her cousins. My sister Rachel and sister-in-laws Michelle, Heather & Kellie have been so amazingly generous and rotate days watching her so that I can spend time at the hospital. It has been such a blessing to me and to Carly and I am so grateful for their willingness to help out like they have. 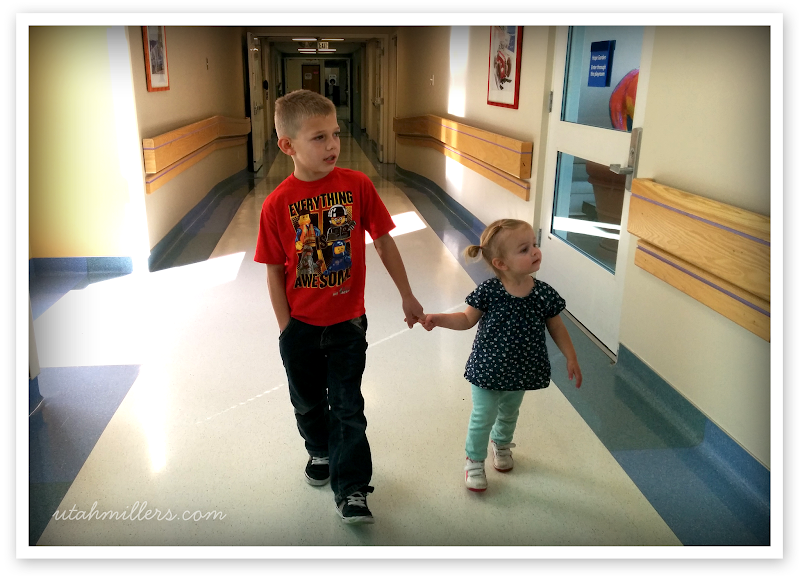 Bryson and Lilly are really learning their way around the hospital. We bring them up on the weekends and they love it. Lilly loves pushing the buttons on the elevator and Bryson loves hanging out and playing games with the amazing volunteers in the play room. Seriously, the volunteers are incredible! They all know Bryson and Lilly by name and we appreciate them so much! I know all I've really been posting about is Carly lately, but Bryson and Lilly have also been up to a lot of great things, so I'll try to get a post up soon about them.